Remegius van Leemput's copy, painted 31 years before the fire. 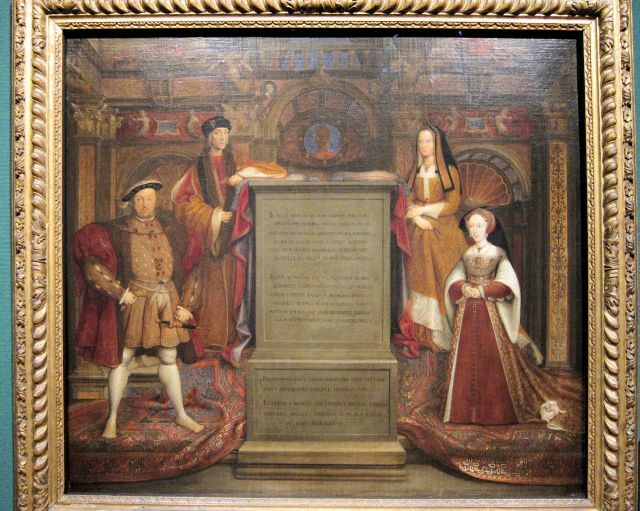 Employed as the King's painter in 1536, Hans Holbein the Younger painted, in 1537, a mural depicting King Henry VIII, his late father Henry VII, his mother Elizabeth of York, and his then-wife Jane Seymour. It was considered Holbein's greatest achievement and includes the most well-known depiction of Henry VIII, despite the fact that the mural was destroyed by an accidental fire in Whitehall Palace in 1698. The original mural survived intact in the Privy Chamber of the palace for 162 years, during which time prints were made of the painting, and in 1667, Remegius van Leemput painted a full copy of the piece, although at a much smaller scale than the mural, which had been life-sized, depicting the four figures at their full height. 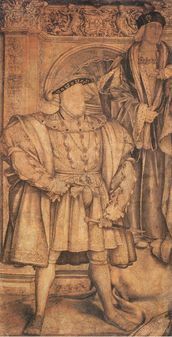 A half-portrait of the king by Holbein has survived, as well as the left-hand section of the pencil sketch for the mural. In that era, when preparing for larger paintings, artists would generally draw a full-scale paper draft in great detail before commencing their final piece on board or, in this case, wall. Most paintings of Henry VIII, including portraits with him as a lone figure, are based, ultimately, on this lost original. 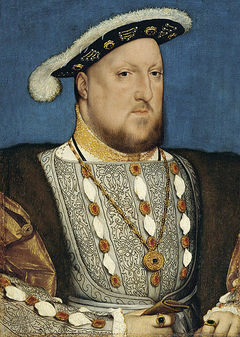 Holbein's half-portrait of Henry VIII. The surviving section of Holbein's sketch for the mural.